Kids love to play and one of their favorite playtime is cooking. What we often do is we buy our kids various cooking toy utensils. However, this often leads to scattering and we may need to buy a separate storage bin to keep our kids toys in order while teaching them to be organized. But what if we tell you that there is an all in one kitchen play toy that allows your kids to develop and enjoy their cooking playtime while, at the same time, educating them the value of being clean and organize. Manufactured by KidKraft, the Farm to Table Play Kitchen is one of the sought after toys where kids, especially those who loves cooking as their playtime, will surely enjoy. Measuring 44.2 x 26.3 x 43 inches (112 x 67 x 109 centimeters) when assembled and weighing 57 pounds (25.8 kilograms), this is one of the few playsets that has almost a life-size measurement where kids will play with it as if it was a real kitchen rather than a toy. With its relatively huge size as a toy, it features an 18-piece accessory that is composed of kitchen utensils, toy fruits and vegetables, an oven, a gas burner, a faucet, a chalkboard, an ice maker and storage bins. When kids go cooking for a play, what they usually do is get their playset and cook randomly what they want. But with Kidkraft Farm to Table Play Kitchen, they will cook following a written menu. This is courtesy from the chalkboard that is located on the top left side of this kitchen playset. The menu listed on the chalkboard may be personally requested by you as their parents or as a customer, or perhaps, a menu that is being requested by your kids friends. In this way, your kids attention will be focused on how to prepare and cook that requested menu, where many parents have deemed it a good part of brain development especially on focusing to complete a particular task. Even if it is considered a playtime, but have you observed what kind of foods your kids are cooking? The frequent answer to this question would be hotdogs, bacons, hamburger and the like. In other words, they are cooking processed foods. This in turn will trigger their real gastronomic appetite to eat what they are cooking. Mommy I want hotdogs, bacons and hamburger. With the Kidkraft Farm to Table Play Kitchen, your kids are encouraged to cook vegetables. This playset only has vegetables and no processed foods. This will hopefully encouraged them to eat the real green-leafy counterparts on the plate and at the table. The Kidkraft Kitchen does not just develop your kids green gastronomic appetite, but also their “Green Thumb”. Compared to other playsets where the toy ingredients are stored in a plastic containers, the ingredients in this popular playset is stored in a designated garden box located next to the chalkboard. This will give your kids the feel as if they are harvesting their own vegetables from a backyard garden. Once they harvest the toy vegetables, they can wash it over the sink (located at the central portion of the playset) and will have a feel as if they are getting rid of the soil and other earth elements. This sink has a built-in faucet. But take note: it is not connected to your water pipings nor does it need any fitting. No water will come out of the faucet. Instead, when you turn on the faucet, a dash of light will illuminate coupled with a splashing sound that imitates the gushing of water. Once you’re done with washing the vegetables, you can now place it on the working table located on the leftmost side just in front of the chalkboard. There your kids can chop the carrots and onions on the cutting board with the use of wooden knife. Note: the vegetables are already pre-cut and you can put back in the pieces in place after playing and store it in the garden box. After you have washed and prepared the vegetables, you can now direct your kids to cook the prepared ingredients. The Kidkraft Farm to Table features two ways on how to cook. You can either choose the gas burner of the stove located at the rightmost side just in front of the garden box or at the oven located under the stove. Same with the faucet, it does not need any actual connection to your gas pipe. Instead, once you turn on the gas knobs, a dash of light will start to illuminate which simulates as if heat is being produced to cook your vegetables. The Farm to Table Play Kitchen is not just about cooking food, but also trains your kids to prepare cold drinks. Yes, there is a faucet and cups, but ask your kids how can drinks possibly become cold when there is no refrigerator. Most probably your kids will utter no words, but instead, will point you towards the lower left side of the playset where an ice-maker can be found. With a single press of the button, you and your kids will be surprised to see 3 toy ice cubes coming out from the dispenser. To make things more realistic, once the ice cubes drop, grab it and immediately place it in a glass and say to your kid: “it’s very cold”. At the end of the day, we as parents know that this particular playset is just a part of our kids playtime. While that premise may be true, wait for days, if not weeks or months and you will be surprised that your will kids will be in the real kitchen planning and preparing for their healthy meal. 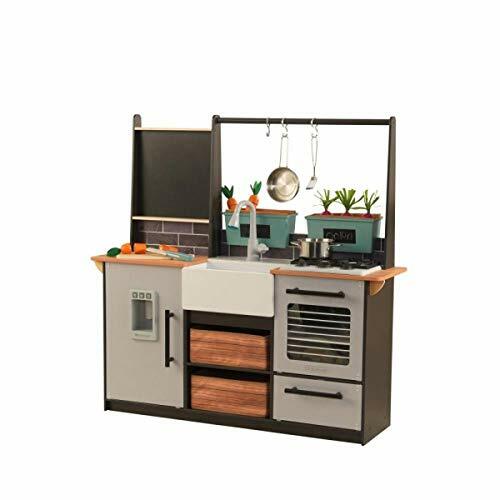 While you are impatiently waiting for the warm summer days when your kids will be enjoying the swing set in your backyard, it will be a great idea to support their indoor activities with this marvelous pretent play kitchen set! PS: . This playsey has small parts and accessories and is NOT designed for kids UNDER 3 YEARS OLD.